Hosted by Chris Castle, with guests Raúl Barroso, Alasdair Monk, Jon McCartie, Annie Sexton, and Niklas Richardson. Heroku is a remote-first company, and for some employees, it's their first time working on a distributed team. Five different Herokai talk about what's worked (and what hasn't), ranging from their home office setup, the necessity in establishing a schedule, staying engaged with the rest of the company, and how to get a strong Internet connection atop the Rocky Mountains. More than half of the employees who work on Heroku are remote or distributed employees, meaning Heroku is what you might call remote-first. Host, Chris Castle, brings together five Heroku employees who have had interesting distributed employee experiences. They share some personal stories and discuss setting boundaries, self-awareness, timezones, and some advice for others interested in distributed work. Raúl Barroso is based in Madrid, Spain. He compares his experience working at Heroku HQ with his current experience as a distributed employee, working from Spain with a team across Europe and the U.S. He also shares his thoughts on the phrase “remote employee” vs “distributed employee” (hint: use “distributed” if you are serious about fostering a culture that values distributed employees as equals to those at HQ). Alasdair Monk is based in the UK. He published a blog post in September 2016 titled Making remote work: What we’ve learned at Heroku discussing distributed work in three categories: working asynchronously, working together, and staying aligned. He reflects on his experience in the past two years since writing that post and also shares his perspective of UX and Design work as a distributed employee. Jon McCartie lives way up in northern Idaho by the Canadian border. He and his wife decided to spend 1.5 years with three kids (ages 7, 5, and 2) traveling around the western U.S. in an RV. Oh, and he did this while working on the Customer Support team -- successfully. 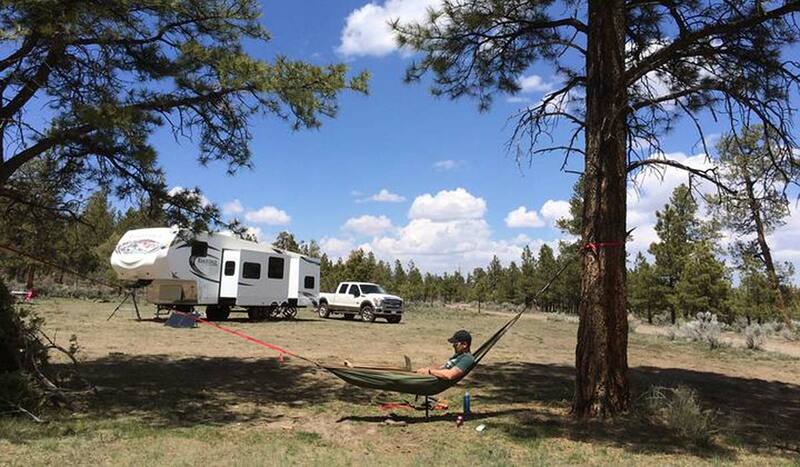 He shares some fun stories of video meetings with gorgeous views, choosing the right size RV, and using a mobile Wi-Fi hotspot as your family’s primary internet connection. Here is a picture of Jon’s “office”. Niklas Richardson is based in the UK. He shares why and how he put his desk in the garden. He poured a foundation and then bought a pre-fab shed that he had insulated and electrified. 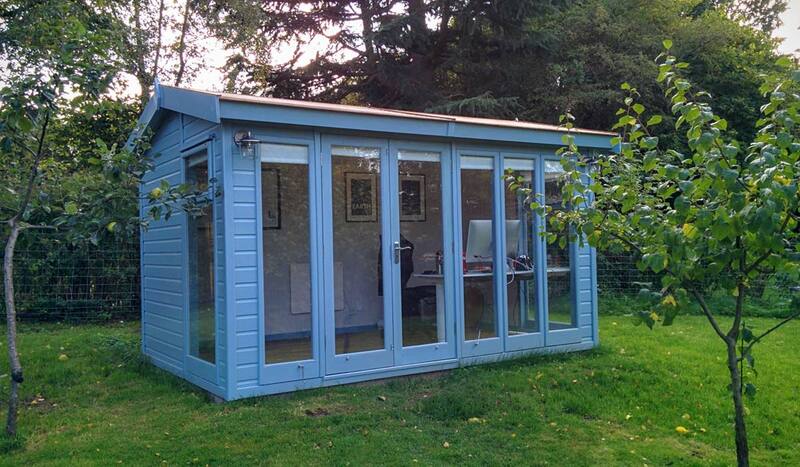 Here’s what Niklas’s beautiful backyard office--aka garden oasis--looks like, and also the website he mentions in the podcast showcasing other beautiful sheds. Chris Castle: Hello and welcome. I'm a developer advocate at Heroku. I'm Chris Castle and I'm joined here by some other awesome Herokai. Heroku is a bit unique in that 60-70% of us are remote employees so Heroku is what you might call "remote first". 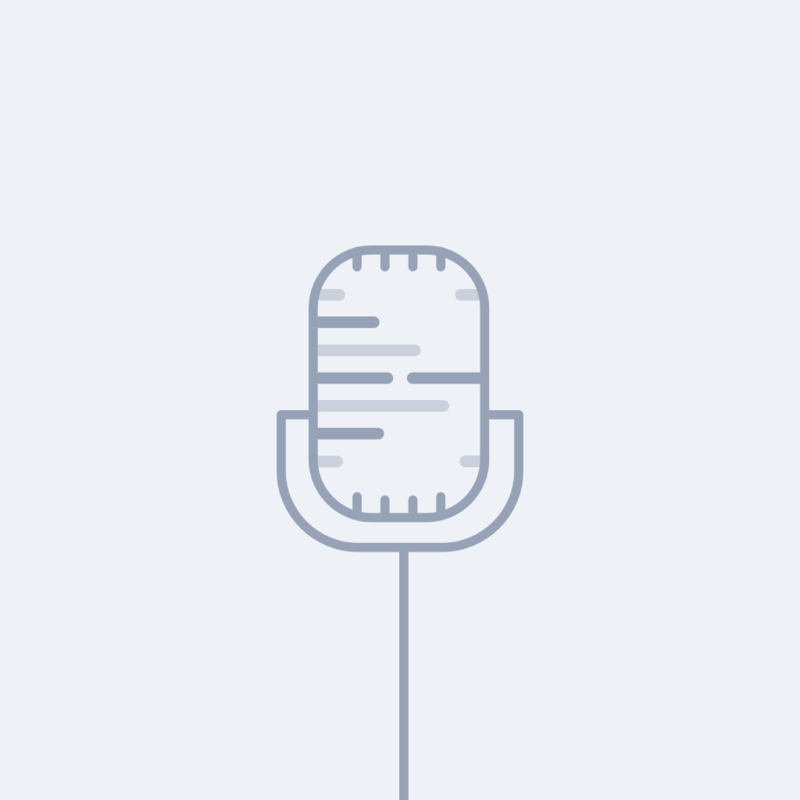 And I've gathered together a few of what I thought were folks who had more interesting remote employee stories to share with you. Let's let you all introduce yourself. Niklas R: I'm Niklas Richardson. I am a customer solutions architect based in the UK. Jon M: My name is Jon McCartie. I help manage the support team. I live in North Idaho up near the Canadian border in the middle of nowhere. Alasdair Monk: My name is Alasdair Monk. I'm a user experience principal at Heroku and I'm based in London, in the UK. Annie Sexton: My name is Annie Sexton and I'm on the core support team so Jon, over here, is my manager. Right now I'm based out of Austin, Texas. Raúl Barroso: Hello, this is Raúl Barroso based in Madrid. I'm a developer and I've been here for so many years. [crosstalk 00:01:26] I cannot remember. Chris Castle: More that one. Cool, we'll start right in with you, Raúl, actually. So you have worked both remotely and at HQ? What was it like moving between those two and what are some of the things you miss in each? Raúl Barroso: The decision, I don't think it was that hard because basically by having all the contacts about what the teams were doing and all that, it wasn't that difficult. What I found the most difficult is finding my own rhythm, knowing when to start and even where to go to do work, right? Here in the HQ I knew there was an address that I could go to and I had my own desk and I could just do work and I knew what time people usually started their days. So, it was just something scheduled, something prepared, something I could adapt to. Raúl Barroso: Where, as a remote employee, it was more like, okay, do I do it at home, should I have my own desk, or should I find a co-working space? You know, all those questions that I needed to figure it out by myself, it was basically the most difficult. Yeah I don't think it was by the fact that I transitioned from HQ, whereas if I had joined a company as a remote employee from the beginning, it would be, I think the same challenges that I faced. Raúl Barroso: And in terms of what I miss the most, for instance when the office was really crowded, so I had difficulties on focus, so I don't miss the noise I guess is what I'm trying to say. Right? Raúl Barroso: I'm not saying that people were loud or anything, but you know, sometimes it's difficult to concentrate. So, what I miss the most, really, is the actual water conversations that you have. So, for instance, the place that I usually go to, they're technical people, they do similar things to what I do, but they're not working on the same problems, they're not working on anything Heroku-specific. So, it's hard to get that connection, I guess, sometimes. Chris Castle: How have you filled that in, or how do you get that connection working remotely? Raúl Barroso: Things like this, conferences we were having or at least my team trying to meet every other three months. We tend to alternate from Europe to US, our team is fairly distributed across these two areas, I guess, and so we try to be fair with each other. So, for instance in February we met in Miami and then a month ago, we met in Lisbon. So, in a more frequent manner, just Slack obviously helps, not the same, and obviously the meetings that we frequently have, which are stand-ups. So having some room for casual conversations, make sure we are not compressed. We have 30 minutes and we only talk about work at those 30 minutes. So that helps. Chris Castle: How many people are of your team, or what portion of your team are remote versus at HQ? Raúl Barroso: I'm glad you mentioned versus HQ because sometimes, actually when I used to live here, I used to use the term remote a lot and I remember Harold, who was someone who used to work in Heroku and I admire so much, basically make me the correction of saying it's distributed, right? It's like who are local versus who are remote. To me, remote sounds like diminishing. You know, first-class citizen is the one who lives in San Francisco and goes to HQ versus the one, you know, the rest. Raúl Barroso: So, there's only one person who lives in San Francisco, DeVaris Brown, a Project Manager of the team and the rest basically are elsewhere. So that's the distribution. Chris Castle: Does your team function well as a distributed team versus as a co-located, in the same physical space? Raúl Barroso: Yeah, I think so. I mean, it is true to be said that all of us, I think, are really experienced so I think with some guidance, just a little bit, in a meeting, we talk about what we need to do and we'll just go and do it. Whereas, maybe if I didn't have that experience or any other of my teammates, it would probably be a little bit more difficult. So, to be fair, some of the challenges I think we've faced, in the past whenever we wanted to hire someone is to think, okay it would be helpful to incorporate someone junior to the team. But at the same time we ask ourselves the question, do we have the set-up that would allow the junior person to succeed? So I think that's tricky, we're trying to find the sweet spot there. Alasdair Monk: Yeah, that's right. 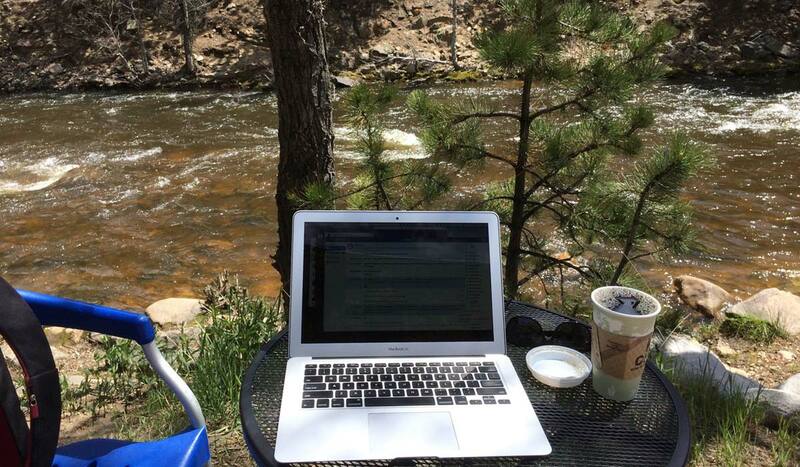 Chris Castle: You wrote a blog post on the Salesforce blog about remote work. I think you were fairly new to it or about 18 months into it and we can share the link to that blog post, but does it still ring true? Alasdair Monk: Yeah, I think so. So, to give a bit of context as well, this was my first remote job I'd ever done. I had previously worked at a start-up in London, we were all on our first, we didn't have any distributed employees and I think in my first 12 months at the company, I just had no idea what I was doing. Like to Raúl's point, the social aspect of work that you don't really have the kind of office ambience, it just doesn't exist when you are working from home. Alasdair Monk: No worries. And he writes whatever your vision for the company and then his direct reports alone, they write theirs but it aligns to his and vice versa. All the way down through 40,000 employees so you end up with 40,000 of these documents that all are aligned from the kind of bottom-up. And I think it's really smart and it sounds a bit consultantsy and a bit like, hmm let's matrix this thing, but it's a really great tool to have at the beginning of the year. Alasdair Monk: And then the kind of cadence that we have with these off-sites in coming together in person, so whether it's in Miami, or New York or in wherever, really kind of come in and huddle back together and sort of check in on, okay where are we in the year. It's like one quarter in what did we say we were going to achieve? How far are we along to that? Do we want to change what we think we're going to do this year? Alasdair Monk: And I think that model works really well in place of the office environment, where it's very easy to just go in every day and see what the goals are you're constantly talking about them or you hear people talking about what they're up to etc., etc. So, I don't think like much has changed in the last 18 months other than we've just got better at it, to be honest. Alasdair Monk: And as we'll have more experience of working this way, we're just kind of getting more efficient, getting better. Chris Castle: Yeah. Do you think there's anything uniquely challenging for someone working on user experience design or product design as compared to the engineers who work remotely at Heroku? Alasdair Monk: This a good question. Yeah, I think so. I think it's very different because design is set up in such a different way to engineering and even to product, really. So there's four of us in product design and a design manager that essentially work with the entire engineering organization and the entire products organization. And so, we really kind of play a facilitation sort of role, I think because one of the things I really hate about the job title "design" is that it implies you are the person that designs everything and that's not the case at somewhere like Heroku, right? Alasdair Monk: But a company like this, everyone designs the product, right? It's the details in everything that couldn't possibly be pre-planned that make Heroku such a great product to use, right? And I think what the role of design is really just drive and kind of curate that product. We're not the people that exclusively design it. But the remote aspect makes it difficult, right, because of that distance. Alasdair Monk: Ideally when you are, especially the early stages of designed a product, you want a round table. You want to sit around like this. You want to have people sketch things out how they see them. You want to see how people understand things and especially the technical nature of the products. There's no way that I can go away and learn everything about Kafka and how it's going to be used by all of our customers. It's much easier to have the people who have been working with that product, building it for the last six months, have them explain it and how they would use this thing. And then okay, how would we apply how this person uses this to our entire customer base. Alasdair Monk: So that's probably the biggest challenge, white boarding, sketching. It's kind of crazy you know, video conferencing has been around for decades or decade, but whiteboarding, there's these really high tech solutions on iPads and these devices that Google has made that cost 20 grand that you roll into a room. Those robots that go along with the iPad faces, terrifying. Jon McCartie: Yeah, they're creepy. Alasdair Monk: But nothing is a substitute for paper and pen and post-it notes. Chris Castle: Yeah, so how do you do paper and pen and post-it notes? Like I've sometimes drawn something when I work with your colleague, Charlie, the designer. I've drawn something, sketched it on this, I don't know, the back of a bill I have at home, taken a picture of it and then sent it to Charlie in Slack and said, can you make this look like Heroku and look awesome? But, how do you guys get around that? Alasdair Monk: Yeah, I think we're still figuring it out, to be honest. One of the methods that we've been using recently, and kind of trying it with some of the enterprise features that we've been working on ... because they were so ... it was the first time that we were working in a really large team so multiple teams and plus 30 people working on this one project. And this really became a sticking point, when you're trying to convey ideas and you can't always, because of the fact that we're distributed, you can't always be in one meeting even because it's 3am in San Francisco and yadda, yadda, yadda. Alasdair Monk: And we've been, in place of formal whiteboarding and sketching, we've been trialing this idea of design proposals which is a document where we outline a feature that we're working on, the goals of that feature, why are we building this thing in the first place, really, really short, pithy bullet points. And then we have this unresolved section which is essentially a checklist of anyone can go in, so Raúl for example, could go in, "I don't understand when you click this button, where's that going to go? ", and he can put this into this document. Alasdair Monk: It doesn't get lost in a Slack conversation over time and then, once a day when we have a stand-up or even asynchronously we can all check this document, answer these questions in this really structured place so we use Quip which is another Salesforce product, it preserves the ... so even when that question is resolved, where does this button ... where's it going to take me when I click it? If anyone else has that question, it's archived there in the going forward. Alasdair Monk: So, yeah, we kind of use that as the sketching, to be honest. Those questions of how does this things work, we use this really scrappy document. It's erased very quickly but it's more structured than just a free flowing chat room and it also avoids these silos of communication that we get where I'll dial in Niklas for example and we'll have a conversation about something, agree on something, but none of the rest of the team is on board with that, for example. Alasdair Monk: So yeah, that kind of typing out in the open has been pretty successful for us. It hasn't completely replaced what we can get with a pen and paper and getting into a room, but if we can minimize it, at least, to those on-sites that I talked about and we can save the really gnarly conversations for being together. Chris Castle: Yeah, so Jon. Chris Castle: Can you tell us about your unique remote work, or distributed work experience from, was it last year or two years ago now? Jon M: Yeah, so I was just like these guys, it was my first remote job. One of--my wife and I, one of our dreams at some point, I don't know when we got it into our head but we had seen somewhere online or seen somebody who had gotten to this point in their life where they wanted to travel and see things. We were feeling stuck where we were and saw them working from the road and living in an Airstream and traveling around and I was like, that sounds really cool but there's this reason, there's this reason and all these reasons why we couldn't do it and obviously the biggest one was that I didn't have a remote job and certainly not one that would let me do something as crazy as that. Jon M: And so, going into my interview process, I just decided, I'm just going to say I'm doing this thing and you have to be okay with it. So that's part of the hiring deal is that you're going to let me do this thing. And, so I got hired on to the support team as a support engineer and got the job in December and by March we had sold our house and basically gave away almost everything we had or sold it in a garage sale and packed up the rest in an RV and put our kids in there somewhere and we did about a year and a half on the road, traveling. Basically did two laps around the west coast living out of the RV. We started and I didn't know what the heck I was doing. I've never towed anything before in my life. Niklas R.: Did you know how to drive? Jon M: Yeah, thankfully. [crosstalk 00:16:37] But the big difference between driving my little Scion XB to then driving an F250 three quarter ton truck towing 10,000 pounds it's like, "I don't know what I'm doing!" Jon M: We started with the RV park thing and eventually, we met a lot of cool people on the road, other families, a bunch of the people that work remote, programmers, designers, copy-writers. All kinds of different people that we've run into. We meet on Instagram or whatever and eventually got a really cool rhythm to staying in national forests and BLM land, basically free camping in the middle of nowhere. Gorgeous views. It was a running joke for our conference calls. We're like, whatever, what's behind Jon. I'm doing the conference call. My favorite was, what's that over there? Just the Tetons, that's just over my shoulder there and I'm sitting in a field with a MiFi. Chris Castle: Didn't you spend time scoping out where you were going to be for the meeting to make people jealous? Jon M: Oh absolutely. So yeah, it was a really cool thing for us, for our kids and for our family and the ability to, even going back 10 years to cell coverage ... some of the places I worked from were nuts that I was getting 20 megs down on MiFi in the middle of nowhere and there's no way that coverage existed so this idea of being able to do the work that I'm doing, do good work ... I made it a point up front, no one's ever going to ask where Jon is, no one's ever going to ask what kind of work is he doing? I never wanted someone to say, you know it doesn't look like you're really doing a whole lot of work, you're just hiking a lot and you're going to have to go buy a house and settle down because this isn't working out, you know? Jon M: So, I admittedly overworked my first year. I actually go told to calm down a little bit by my boss. It was such a unique experience for us and something that we won't ever forget. Chris Castle: That's cool. So how many souls were in this van or this RV? Jon M: There was five of us, my wife and I and three kids. Jon M: No pets. No. When we hit the road, I think they were seven, five and two. Chris Castle: Okay. And how much space, or, what size of van or RV are we talking about here? Jon M: So funny story about that is that we asked around a lot. We knew a couple of other families, we knew one specifically that had three kids and I was like, what do you have, what would you do differently and whatnot? We bought this 34 foot fifth-wheel which was decently sized. It had a little queen bedroom in front and it had bunk beds in the back, a little kitchen area in the middle and everything and we thought, there's no way, this is going to be terrible. It's going to be so hard to get used to, coming from a 2,000 square foot house to a 200 square feet. Jon M: And after probably six months, it started to feel too big. Just dragging it around to certain places ... you end up in these national parks in the US, the majority of the campgrounds of them were built in the 30s and 40s, they were WPA projects and they weren't used 26 feet of truck and 34 feet of trailer. You get in these little tight spots you know, like "God, this is terrible, we should just get a smaller trailer". Jon M: So after our first year we sold that and downsized to 26 feet. We're talking about going back out on the road, maybe part-time, maybe a couple months out of the year and we're now talking about just a pick-up truck and a tent. So you slowly get used to living in smaller spaces. There's somebody else that Heroku was asking ... he wants to go out with his wife and his baby and he's like, "what should we start with?" And I was like, I don't know? How much comfort are you willing to let go of? But yeah, it was a learning experience for us. Chris Castle: Yeah, that's cool. You mentioned internet a minute ago. What was your internet expense or cost for that? I imagine it's higher than what it is in living in a house where you have a fixed internet connection. Jon M.: Yeah, what's that like? Jon M: We started out with just our own MiFi that was like 20 gigs for like some abhorrent amount of money, it was like $80/$90 a month and spend most of my day yelling at my kids to not get on Netflix or just policing the internet when you've got caps like that. And then, eventually, wound up getting just really weird sub-culture of leasing or purchasing old grandfathered unlimited accounts on different networks. I won't say who so I don't get mine taken away. Jon M: Yeah, really expensive, unfortunately, but it's just one of the things that you just go into knowing that I'm just going to pay more for my internet. As an engineer, I got to geek out on installing antennas and WiFis and all kinds of craziness. You know, you get these boosters that can give you ... you go from one bar to five bars and nothing down to 20/30 megs down. You've got it on a rotating antenna and you can point it ... it's a directional antenna. I geeked out on the whole thing. I think I actually spent, you know the budget that you get for home office supplies, on antennas which was pretty fun. Jon M: It's a little expensive but you kind of know it going in. Chris Castle: Cool, so how about Annie? You also have an interesting story of distributed work from I guess it was last year and the year before? Annie Sexton: Yeah, so for most of 2017, I was a, quote unquote, digital nomad where I just traveled the world and worked off of my laptop which had been a dream of mine since I can't remember when, like a long time. Heroku was basically my first remote job. I worked a little bit on my own project remote, but I was still definitely still finding my feet. Annie Sexton: But even before I landed my Heroku job, I had just decided that in 2016, in October, I would spend the entire month in Thailand because I need to start putting my money where my mouth is. So, I, before I even had a job, I had this whole trip planned and I think I bought, I booked a hostel for an entire month, months and months in advance, which, let me tell you, is far too much planning. You do not need to do that. Annie Sexton: But I was like, I'm just going to try it because it was a very romanticized idea in my head, and I think it is for many people who haven't tried it. But, as fate would have it, I did land this job with Heroku which was very serendipitous and because of that I was allowed to ... it helped me work remote for a month in Thailand and that was, sort of, the stepping stone. At that point, I had already gotten a lease, I had an apartment in Austin and then that was about three months in and then I went to Thailand and then I thought, oh no, I can't keep living in Austin, I need to do this right now. Jon M: "How was Thailand? You should keep doing that." Annie Sexton: "You should keep doing that." Exactly! And I was like, oh yeah, fine, twist my arm, right? Yeah. And with that level of encouragement, I managed to get some dude to take over my lease and off I went. Annie Sexton: And so in 2017 I started in Japan because I used to live there and I was just dying to go back. So I was in Tokyo for about two months, and then I was in Bali for about another month, and Morocco, I met up with a bunch of friends from Thailand, from that first time in Thailand, we just all just lived in a big old Riyadh house. Annie Sexton: And then afterwards I went to Croatia. There was a little bit where I was in Slovenia although I wasn't working during that time. Just a little weekend trip. And then I came back to America for a few months and then promptly went back to Thailand when all of my nomad friends were all there. Thailand is sort of like a home base for many of them because it checks a lot of boxes. It was a really incredible experience, absolutely. Chris Castle: So you and Jon work in support and our customers, Heroku's customers are all over the world. Was that a pro that we could have people in different time zones running Heroku support? Annie Sexton: I definitely think I had it easy. I know that other engineering teams, it's not quite as straightforward because there's a lot more co-operation involved. Not that the support team doesn't collaborate with each other, but if need be, you can be a bit more siloed because you're just answering tickets. I'll say, it was hard when I was traveling around and I was in time zones where there weren't as many support agents. The majority of them are in the US time zone but we still have, the majority only by a little bit, like there's still a good half of us that are in other parts of the world. Annie Sexton: It was great being able to work directly with them because I got to know them better which was really cool, but it also meant that there were fewer people awake and online who I could ask questions so that was a bit difficult. But I do think that the nature of my job made it particularly easy and that was one of the reasons that I thought, I have to do this. I may not get this chance forever so I need to do this now. Jon M: My only tricky one for me, because I really only covered two time zones in the US, but at one point I was in Yuma, so it's like the California/Arizona border which is a time zone split right there. I was in between two cell towers so my clock kept switching and I kept missing meetings because it was and hour ahead, an hour behind, an hour ahead. Jon M: But with Annie, it was actually really great because we knew her schedule and so she was basically floating between our different regions for support. So when she was working APAC hours and she's a month away from going to Morocco and working EMEA hours, we could tell those guys, don't worry, help is on the way. Annie is going to be in your time zone in a month. And they get all excited and they all get really depressed when she'd switch time zones. But it was fun to be able to have her work on different teams and support different regions like that. Chris Castle: So how many different places did you visit or live in? Annie Sexton: Most of the places I would venture about a month or more but yeah, those are the places. And I will say, it's a glamorous as it sounds and my Instagram looks fantastic, [crosstalk 00:27:21] if I do say so myself. It's easy to romanticize the lifestyle of working on your laptop on the beach drinking coconut water, but it's just not like that. Maybe not even half the time it's like that because there's so many other things that you don't ... People will tell you about and you just don't know the hardships of it until you live it, until you get stuck in Kuala Lumpur because you think that you're in the right airport, but actually there are two Kuala Lumpur airports and there's a whole fiasco and you miss your flight to Morocco and it's an ordeal. Annie Sexton: And then, moving so frequently where you have to start over and make new friends every single time. And I'm an extrovert and even then it was really hard for me to start over. So, I'm glad I did it because I think, in my head, it was this perfect lifestyle that I would just be ecstatic all the time, and it just wasn't like that. I would do it again, but I think I have a bit more of a clear head about the whole idea. Chris Castle: Yeah, I imagine there would be this constant conflict between, I want to go explore, versus, I have to not get fired from my job so I can keep doing this and living and supporting myself. Annie Sexton: Yeah, and I'll mention that the best days are the ones where it really doesn't match up with your hopes and dreams for that lifestyle which is, you do some tickets in the morning, and then a friend says, "Hey, do you want to go hang out at an elephant sanctuary?" And you're like, "Okay". And then you go do that for most of the day and you come back and you do the rest of your job. So, not all days are like that and you can't always do the best work when your day is broken up by hanging out with elephants but the best days are pretty good. They really are. Chris Castle: That's cool. Switching to our last guest now, but certainly not least. Niklas here, in the UK. Can you tell us about what's in your back yard? Niklas R: My desk. My desk is in my back yard. 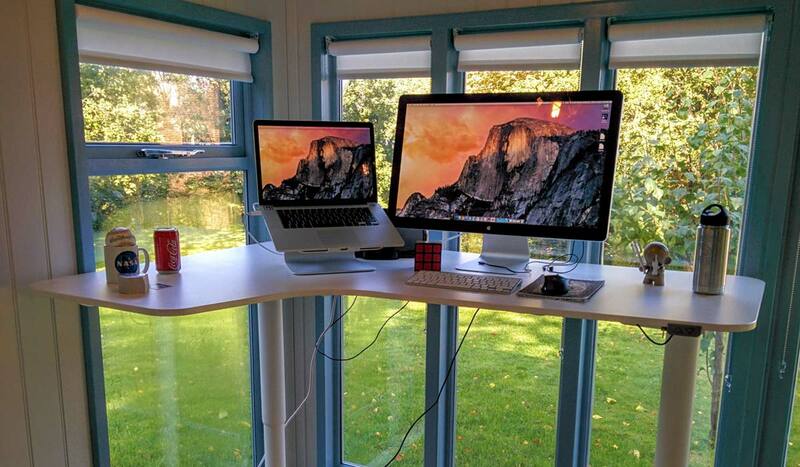 Chris Castle: Why is your desk in your back yard? Niklas R: So, when I started at Heroku, it was the first remote job I'd ever had and the first few months I was working from the dining room. And when you've got kids running around in the other rooms, it's hard to focus and hard to not be distracted when you're constantly yelling at them to keep the noise down because you're on a call. So, I needed to come up with a solution. We didn't have room in the house to put an office, so we're like, we have space in the garden, let's put my desk in the garden. So, we built a summer house, a small summer house, but there's space for my desk and a telescope. Alasdair Monk: Is it that far away from your house that you need a telescope? Chris Castle: Is dinner ready? Are the kids home? Niklas R: It's down the end of the garden. It's my haven where I can just go and focus and the kids can be as loud as they want in the house. Jon M: I know you have questions but I have questions too because I'm thinking about doing this too. So, did you buy a pre-fab thing or did you build it or what? Niklas R: So, I had to build the cement base which required carrying 50 bags of cement and sand around the back of the house which was a lot of work. But, aside from that. [crosstalk 00:30:39] It's basically pre-fab. Niklas R: Well, it comes with the skin, the walls and ceiling and then the chaps that came ... the guys that came to build it. Alasdair Monk: We went so technical so quickly. Chris Castle: We will link to that in the notes. Chris Castle: I've seen photos of this that's how I know about it. We'll share some photos. It looks ... I don't know if you're an amazing photographer or if it actually looks as nice as that. But I remember just seeing the photos of this tiny home, beautiful white colored shed, I guess, or tiny home with lots of windows, lots of natural light in there and these wood floors. And you have your desk, I think a standing desk and you're just standing up looking through these windows and it just looks idyllic. Niklas R: Yeah, it's really nice and yes, the front is glass and it looks out over the garden and the house. It's peaceful. Chris Castle: It just looked like your own, private get-away. Niklas R: Exactly. It also gives me, I think, one of the things I was mostly concerned about going into a remote job is being able to disconnect work and home, and home and work. When I was in the dining room, it was really difficult to do that switch between the two. Raúl Barroso: And do you do, on the weekends do quote, unquote, work? Raúl Barroso: "Oh yes. I'm sorry. I think I need to go there and do some work", right? Jon M: You leave everything out in the ... I was going to say, this shed, it's a summer house. Niklas R: It's a summer house. Jon M: You leave laptop and everything out there. Niklas R: Sometimes I'll bring it in. Chris Castle: I think that's an important point and we can now, maybe, transition to more general topics for everyone. I live in Seattle and do the remote or distributed thing also and I have noticed it's very easy to fall into ... I'm working on something and then I sometimes forget to have a hard stop at the end of my day. I'll be like, I'm just going to move to the couch and maybe I'll eat some food and then I'll maybe watch TV for 30 minutes and then I'll slide back into work. Chris Castle: After I've done that for a few days or it becomes a pattern, it has lowered my quality of life. I feel like I don't have this nice separation and if feel to me that I'm working too many hours also. So working distributedly or remotely out of your home, at least that's been one of the big learnings for me is this discipline in setting my own schedule rather than just being part of the rat race that kind of does the commute in and then works and then commute out and home. Niklas R: Yeah, it's setting boundaries and sticking to them, isn't it? Raúl Barroso: Like the question basically is like saying, when is enough? When I'm done with work? Right? What are the signals that could tell you, okay, this is enough? Not only the amount of hours you probably spent on the day but also actually saying, okay, this is what a full day of work looks like. Annie Sexton: Yeah, it really demands a level of self-awareness that you didn't really know you needed until suddenly there are no boundaries and it's your job to set them. Raúl Barroso: All of a sudden I want to know, where do you live? Jon McCartie: I was going to say, what's your address? Chris Castle: We'll finish up with just like a few shorter answer questions. For each of you, what is, if you had to choose one piece of advice to give to people who are interested in remote work or are thinking about doing some sort of remote distributed work, what would that be? So, just a couple of sentences, we'll start with you Niklas. Niklas R: I think, again, it's setting those boundaries. I think that's the key thing and knowing when your day starts and when it ends. And if you are working inside your house, I think just the psychological, maybe go for a walk around the block before your days starts and when your days ends, walk around the block again. That psychological switch. The airlock, I call it. Chris Castle: Yeah, go through the airlock. Jon? Jon M: I think for me, it's been a big shift for me in my mindset around work where it's similar. It's kind of knowing, going in it with boundaries, but for me it's also making sure to take advantage of the fact that I do work remote and there's a lot of things that I'm able to do because I don't have a commute. I take my kids to school in the morning and that's important. That's something I wasn't able to do before. I would leave, I mean when my oldest was really little, I would leave before she was awake and I'd come home and she was in bed already. Jon M: Now I have the opportunity to do that and so I'm going wake up and I'm going to take my kids to school and have that time. Or, I manage people in APAC so it's like, I'm going to take a two hour chunk in the middle of my day, I'm going to work shift and do hours in the afternoon and I'm going to take this chunk and go on a date with my wife in the middle of the day. Just take advantage of that. Jon M: I think it's really easy to not be intentional about that and as a result, like what Al was saying, you just end up doing exactly the same thing you were doing before and now it's even harder if you don't have those boundaries. It's like, oh, it's 11 o'clock and actually, like you were saying, my quality of life has actually gone down because I'm not taking advantage of my ability to shift my hours or take advantage of life around me, during the day. Alasdair Monk: Yeah, I think it's about culture, really. If I was going to start a company now, for example, I think remote is definitely the way forward. You can hire the best people in the world. I think you ultimately can end up with a much happier work force than you can create in an office. And yeah, having that culture of alignment and discipline as we've all talked about as well, but also creating the spaces and opportunity for ad hoc conversation at work, even though we're not together for us those things like Slack and occasionally we have these ... we actually have a scheduled time in our calendar in design for just watercooler time which is kind of insane. Alasdair Monk: But it's like a scheduled one hour, you can just drop into the hangout and people will be there chatting about what did they do this weekend or model battleship they're building or whatever it is that people do. I think it's really key to have those things and to really, deliberately, build them into your life, essentially. Chris Castle: Yeah. Being deliberate, I think, is important. Deliberate and discipline. Jonan, the other developer advocate and I also have, we've done a scotch happy hour. We're both in the same time zone. He's in Portland and I'm in Seattle but we've done a scotch happy hour over Google Hangout to just not have topics to talk about. Just to check in. Alasdair Monk: Yeah, that's a very nice idea because otherwise, every communication becomes about work. I think it's important to have some down time in there. Yeah. Annie Sexton: I think that it's important to set boundaries where you need to, but also realize that as a remote employee, or not employee, you know, you have a lot of freedom and that can be kind of intimidating just like a blank piece of paper can be a little bit intimidating when you're trying to write something. Annie Sexton: And so, learning to listen to how you actually work, because I think it's tempting to feel like you actually have to put in eight hours every single day, or more. And the reality is, unless you're being timed for that time, for that work, you can work whenever you want to and you need to pay attention to, when I do this, when I work out in the morning, do I get more work done? Or does it actually drain my energy, or should I work out at a different time, or should I spend time with people in the morning, or in the evening? Just playing with all the different knobs that you can to figure out the best way to make you the most efficient worker is really important. Raúl Barroso: I definitely agree with Annie. It's an iterative process, right? It's not, okay, like I said at the beginning, there's not tied to a schedule, there's not prepared so you know what rules to follow. You basically have to come up with your own rules. So, a piece of advice that I would tell to someone who is thinking about starting as a remote employee is to apply to a job that that person is motivated to do, regardless, because it's not about located versus distributed, it's really about, are you passionate about what you're doing? Right? Raúl Barroso: If you have the chance to work at 9pm because you spend most of your morning running errands or doing work-outs. You have to be diligent and you have to be passionate about actually, even if you might feel tired, you are excited about doing that work at 9pm. So, it's not, if you go to remote work or all those sites that offer positions that you can do remotely, instead of just looking for explicitly, what are the places that allow or that hire remote employees. It's more about, I'm interested in doing this type of work, I'm passionate about that, let me see, scope it down from there, to see what companies offer that type of job, really. Raúl Barroso: Otherwise, it doesn't matter if you're at home, if you can actually work from home, because you're not going to last for too long. Right? You're going to be bored. You're going to start checking internet, Google and things, and oh, my day is done and then your job will be also done if you don't actually do the job. Chris Castle: Yeah, it sounds like you're speaking to ... people need to have some intrinsic motivation to do their job and do it well. Chris Castle: You're not going to get that from the buzz of the office. Raúl Barroso: Yeah, and I would argue, and I will conclude with that, that it's just basically, you have to be extra motivated because you won't have the peer pressure. When you go to an office, you might feel like laying down and going for a nap on your own chair maybe, but you don't do that because you're in an open space and there are certain rules that you do follow. But, at home, you have that freedom. You might have the couch right behind you and you might feel like, oh I'm going to actually take a nap, but again, you have to do work. So, you have to really be passionate what you're doing to actually stay in the chair and do work instead of just laying down. Chris Castle: Yeah, cool. Well thank you all for joining and discussing your work as a distributed employee. Raúl Barroso is a coffee nerd who joined Heroku in 2012. He was born in Tenerife and lived in San Francisco, but you can find him in Madrid these days. Alasdair works on creating elevated experiences for developers on the Heroku platform. He works in our sunny London office. Jon has worked in tech for 15+ years, and in leadership for 5+ years. He's made the rounds from corporate, to startup, to non-profit and back again. Rubyist, writer, travel nut, and amateur comic book artist. Annie is a multi-passionate developer with a five year full-stack background. Niklas is a Customer Solutions Architect at Heroku. He strives to make sure our Enterprise customers are successful using the Heroku platform.